The Araneta Center has always brought a lot of firsts to Filipino audiences, and it’s no different this year as it stages the first-ever “Le Grand Cirque” at the Smart Araneta Coliseum in December. 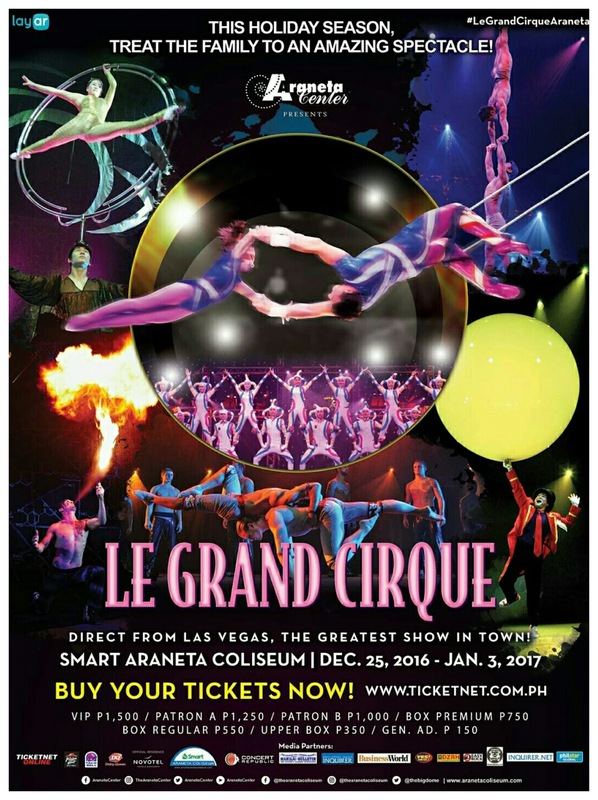 A show that will keep you on the edge of your seat, “Le Grand Cirque” lets audiences feel the thrill of death-defying stunts and unbelievable acts as in a spectacular show families can enjoy this Yuletide season. Direct from Las Vegas and touted as the greatest show in town, “Le Grand Cirque” promises to give high-octane family entertainment with its mesmerizing display of impossible feats of agility and strength. It is a big-scale circus production that features a group of world-class performers and artists that come from Europe, Canada, China and the UK. Combining comedy and high-risk acrobatics, the dynamic and engaging circus show has enamored audiences all over the world. “Le Grand Cirque” mixes traditional circus acts with modern theatrical techniques to seamlessly convey a narrative or theme. It is packed with thrilling action and humor leaving its viewers, young or old, watching with bated breath. The amazing show will feature a series of jaw-dropping routines like a Russian swing, where acrobats do impressive high jumps as they are tossed from one large floor-mounted swing to another. Acrobats and contortionists will gracefully perform high in the air and on-stage, thrilling audiences with various acts involving suspended aerial cubes, high bars, and hanging poles. Trapeze artists will also showcase their gymnastic skills with beautifully choreographed aerial stunts. Fire-breathers, hoopers, jugglers, and strongmen will also show off their skills alongside clowns that bounce along the sides of the stage. It is going to be an exciting visual display of talent mixed with an amusing play of lights and music that perfectly set the mood for every act. It also promises an extravaganza of action and spectacular choreography as well as colorful and elaborate costumes. Sure to capture the thrill and excitement that Christmas brings, “Le Grand Cirque” shows will run from December 25, 2016 to January 3, 2017 at the Smart Araneta Coliseum. For more information, visit Ticketnet website at www.ticketnet.com.ph or call its hotline at 911-5555. San Pedro Barbeque Sauce Atbp. !